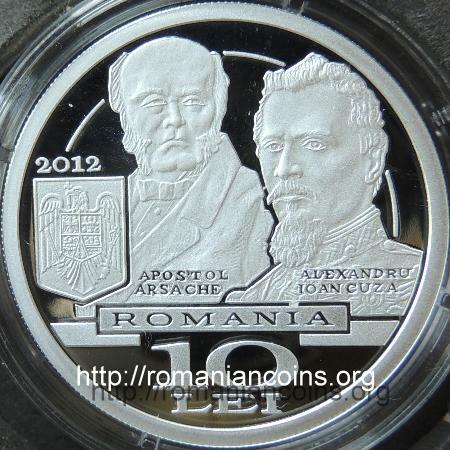 year 2012, coat of arms of Romania, ROMANIA, face value "10 LEI", at left bust of Apostol Arsache, at right bust of Alexandru Ioan Cuza, with inscriptions APOSTOL ARSACHE and ALEXANDRU IOAN CUZA Reverse: an image of Sturdza Palace, where the ministry functioned for a period of time, the Latin motto used by the institution - SEMPER FIDELIS PATRIAE (meaning ALWAYS FAITHFUL TO THE FATHERLAND; adopted in 2010, when minister was Mr Teodor Baconschi) and inscription "MINISTERUL AFACERILOR EXTERNE 150 ANI" meaning "MINISTRY OF FOREIGN AFFAIRS 150 YEARS"
Apostol Arsache (1792–1874) was born in Epirus, in the village of Hotahova. In 1804 he went for studies to Vienna. He got his doctorate of philosophy at Halle (Saxony), where he was called Apostolus Arsaky, having been considered "Epirote". His thesis, written in Latin, studied the brain and the spine marrow of fishes, and is even now accessible on Google Books. Since 1814 he moved to Bucharest, where he professed medicine. He was kin to the family of Tositsa , about which Ion Ghica wrote in : << Koutsovlachs, who had reached the upper class, as Sina, as Tositza etc., call themselves Greek, but their hearts throb whenever they hear about Romanians, about Romania and the Romanian language, which they call "arămănească" [Aromanian].>>. Apostol was, hence, Aromanian. Apostol Arsache had entered the diplomacy of Walachia as soon as 1822, later on having participated to the political life of the principality. 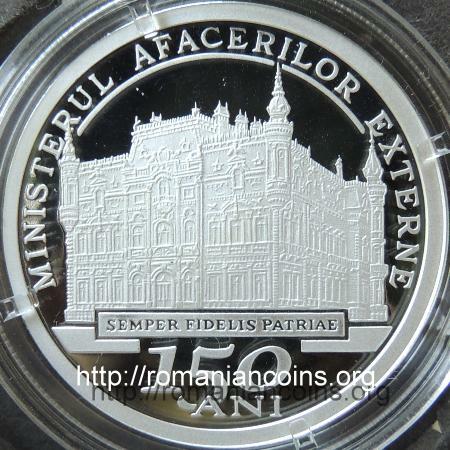 Between the 22nd of January and 24th of June 1862 he was minister at the Ministry of Foreign Affairs [Ministerul Afacerilor Străine]. Between the 8th and 24th of June 1862, Arsache was also ad interim president of the Council of Ministers (equivalent to a prime minister; on the 8th of June Barbu Catargiu, former head of the government, had been assassinated). Arsache was one of the philanthropists who have helped with money the Greek state. One of the Educational Institutions he generously sponsored bears his name up to this day - Arsakeion. Palace Sturdza was built between years 1898 and 1901 by architect Iulius Reiniqke for Grigore [Gregory] Sturdza (1821 - 1901), son of Mihail Sturdza, prince of Moldavia between 1834 and 1849. Grigore Sturdza participated to the Crimeean War in the Turkish army (under the Ottoman name of Muhlis Pasha). In 1859 he candidated to the throne of Moldavia, and later he entered the politics. 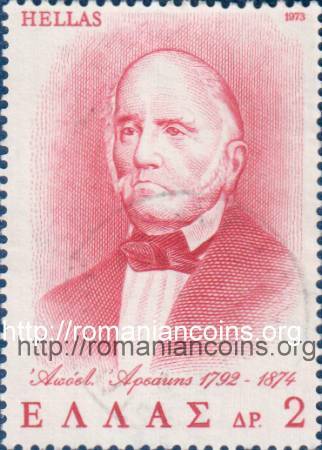 He established at Bucharest approximately in 1879. In the epoch he was nick-named Beyzade Calf [Beizadea Viţel] (beyzade, as he was son of a prince). Grigore Sturdza mastered an impressing physical force, and it is said that he exercised by carrying a calf on his back, similarly to the legendary Greek athlete Milo of Croton - hence the second part of the nick-name. After the death of prince Sturdza, the palace has become the location of the Ministry of Foreign Affairs. Since 1937 the Ministry has moved to a nearby building, the today's Victoria Palace. The palace was bombarded during the war and was demolished in 1946. In the epoch the palace of the Ministry of Foreign Affairs was not too appreciated, criticism aiming especially to the blending of styles, the heavy adornments and the turrets. 1. Bacalbaşa C., Bucureştii de altădată. (Bucharest of Yore.) Editura Eminescu, Bucureşti, 1993. 2. Ghica I., Din vremea lui Caragea. Scrisori către Vasile Alecsandri. (From the Time of Caragea. Letters to Vasile Alecsandri.) Editura de Stat pentru Literatură şi Artă, Bucureşti, 1960. 3. Wikipedia, Apostolos Arsakis, May 2012.